Hi everyone! Welcome to the Paper Issues blog hop sponsored by The Twinery. You should have arrived here from Lesley's blog. If this is your first stop, be sure to stop by the Paper Issues blog to start from the beginning. Our challenge, for the next two weeks, is to use twine on a project. Here's the layout I made for this challenge. I used twine to sew buttons onto the page, make a bow for the button on the tag and stitch an 'X' in the center of the camera paper clip "lens" (as well as to stitch the clip into place inside the bookplate). Are you ready to join in? Link a project up to the Paper Issues blog between now and September 21st, and you'll have a chance to win a wonderful sampler pack of twine from The Twinery (pictured below). Look at all of those yummy colors! Thanks for stopping by today! I hope you were inspired to dig into your stash of twine so you can create a project to link up with us. Next up on the hop is Mary Jo. Go check out her fun project! She is so beautiful! Such a great layout and lovely daughter Lisa! Such a fun LO...love how you combined the twine with the camera clip! Love this layout Lisa! What a pretty photo. I love all your stars & camera embellies the most! Fabulous job! Love all the little details. And the color scheme. Lovely layout Lisa!! Love your style and love the color combo!! Gorgeous! Love what you've done with the twine! I love it what a totally fun and pretty page. Awesome page Lisa! Love how you used the twine to stitch on the buttons!! Great idea! Love what you did here - the colors are fantastic and the layout is just amazing!! 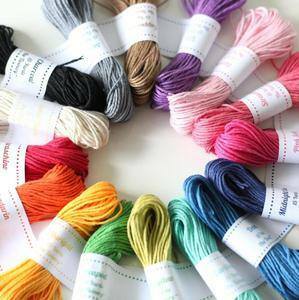 Yes, the colors of twine are oh so yummy! Love the red and black on your layout. Fantastic colors on this layout. This is such a fabulous page! And I love your little criss cross in the camera embellishment!! adorable project Lisa! <3 the bold colors! Great pic of A and darling page. awesome! Love the black, right and red!